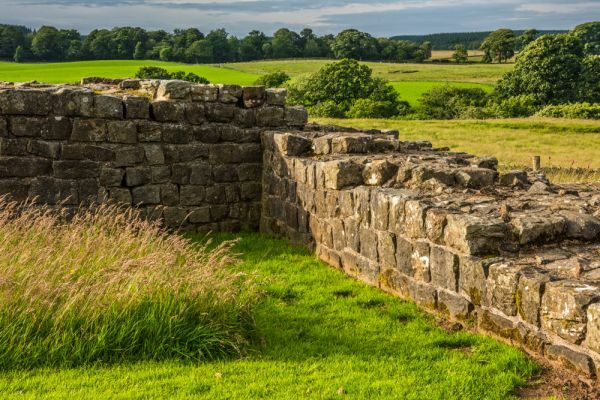 Harrows Scar is a well-preserved Roman milecastle on Hadrian's Wall, on the western side of the River Irthing gorge. The milecastle is part of a well-preserved section of Hadrian's Wall, stretching for over a mile across the east Cumbrian hills. Harrows Scar is connected to Birdoswald Roman Fort, one of the most important Roman forts along the Wall. This section of the Wall west of the Irthing was originally constructed of turf, probably because there was little in the way of proper building stone that could be quarried locally. Towards the end of the 2nd century AD, the turf wall was rebuilt in stone. The stone wall is 2.2 metres across, on foundations 3 metres wide and 1 metre high. 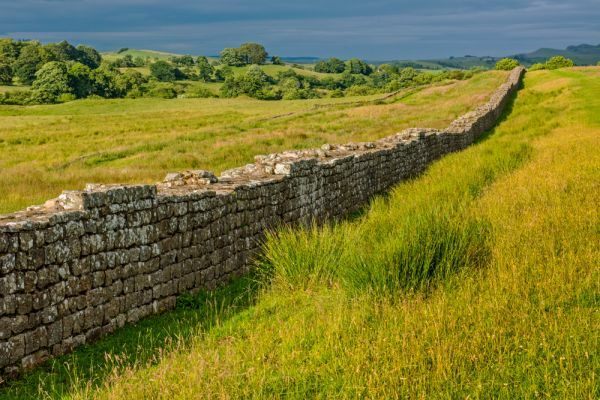 The section of wall between Harrows Scar and Birdoswald is one of the best-preserved parts of Hadrian's Wall, standing up to 2 metres high in places. The stone wall is decorated in several places with inscriptions indicating which centurion headed the work team responsible for that section. The position of these 'century stones' are marked by small metal plaques in the wall. Aside from the century stones there are also a pair of very clear phallic symbols left behind by the Roman legionaries. Though the Wall was nominally built of turf, in fact only the top section was turf in several places, with the base and centre sections of the wall made up of clay, earth, and rubble. 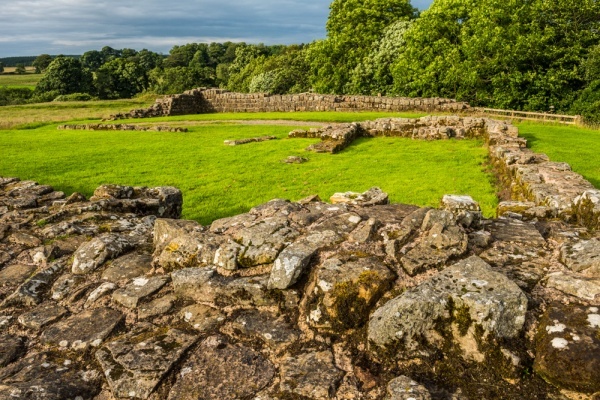 The milecastle, like the wall, was made of turf. 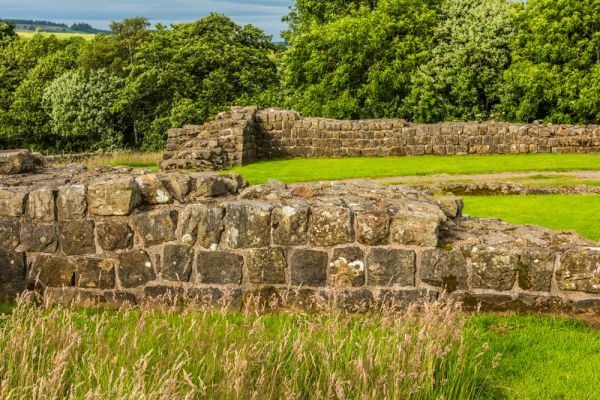 No trace of stone foundation walls has been found within the turf walls, so any buildings within the milecastle were likely built of timber. The milecastle was a rectangle built with its shortest side against the wall. The walls were an astonishing 6.1 metres wide, enclosing an area roughly 15 metres square. The section of turf wall west of Harrows Scar was rebuilt in stone before Emperor Hadrian's death in AD 138. Curiously, the new stone wall took a different course to its earthen predecessor, deviating to meet the corner of the fort at Birdoswald. This is the only place along the Wall that the stone wall was erected on a different line than the earlier turf wall. The milecastle was rebuilt in stone at the same time as the wall, on a larger plan, measuring roughly 23 x 20 metres, with gates in the north and south walls. We do not know for certain how long the milecastle was occupied, but it was probably garrisoned into the latter half of the 4th century. 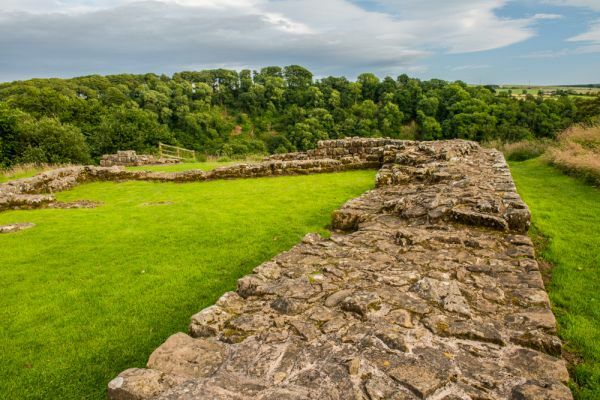 The site was abandoned after the Romans left in the early 5th century but was reoccupied by the 16th century, and the remains of a post-medieval building can be found within the Roman foundation walls. Part of the southern section of the fort has collapsed into the gorge below due to erosion, but most of the outer milecastle walls remain to a height of 2-3 courses, making it very easy to understand the layout of the site. 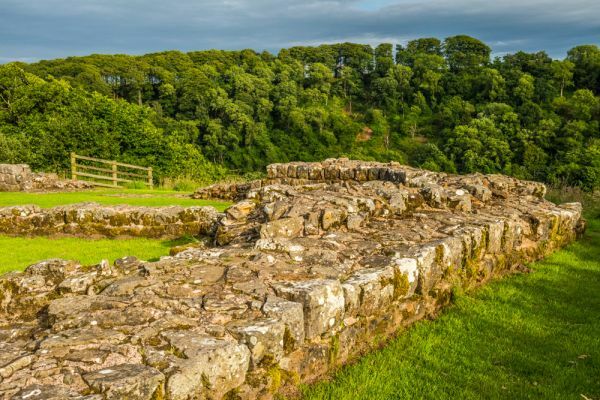 When the milecastle was excavated a Roman altar was found, with inscriptions showing that it was dedicated to Silvanus, the Roman spirit of the woods (the name Silvanus means literally 'of the woods'). Harrows Scar is also known as Milecastle 49. The milecastle is very easy to reach on foot from Birdoswald Roman Fort, just west of Gilsland village, off the B6318. There is a pay and display parking area (the fee is refundable if you are visiting Birdoswald). From the fort, Hadrian's Wall Path leads along an extremely well-preserved section of the Wall, on a level section of the ridge above the river Irthing. Just before the ridge dips steeply down to the river is the milecastle. If you fancy a longer walk I can highly recommend starting at the free parking area at the western edge of Gilsland village. Follow the Hadrian's Wall Path past Willowford turret to the old Roman bridge remains beside the River Irthing. A striking modern footbridge crosses the Irthing near the place where the original Roman bridge once crossed, and on the far bank the trail climbs steeply up the hillside to Harrow's Scar. I've taken this walk several times, and I think it is one of the most scenic sections of countryside along Hadrian's wall. Location: On a minor road off the B6318, 0.25 miles west of Birdoswald. Parking at Birdoswald Roman Fort. Open access site.